Por, Odon. 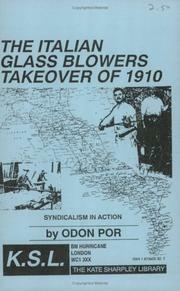 Italian Glassblowers takeover : Syndicalism in Action . Kate Sharpley Library: 1992. 14 pages. An optimistic but fascinating glimpse into early Italian syndicalism, pointing to the self-management by the glassblowers as an example of syndicalism in action. Includes an after word on 'what came next': the crushing of the working class by Mussolini. 9781873605301 Not currently available. Find at a local library. Brown, Tom. Tom Brown's syndicalism . Anarcho-Syndicalism in Puerto Real : from shipyard resistance to direct democracy and community control . Brown, Tom. British syndicalism: pages from labour history .